Luna Park Sydney have confirmed that Tango Train will be retired and removed. The last rides are on the Anzac Day Long Weekend. To celebrate this, they are offering free rides on the old girl over the last weekend. Hopefully they will introduce a new ride to replace this- the Tango Train had certainly built up quite a following and it was certainly a fun, family friendly ride. It was fun, we had some good times and laughs on it. I'll have to get there this week and have a last tango myself. I noticed just then. Rather sad it's going, being one of my first rides, and is still fun to this day. Unfortunately it was about time the old girl needed to go, I am sure LPS will so something great with the space, if combined with the old Flying Saucer space next door I could eye a major thrill ride. Sad to see it go but it really is showing its age now. Always fun to ride and always great to operate. Will have many memories of the Tango train. Yes good times, I found this POV video I took 6 years ago on rather warp-speed run on the T-train. Luna Park have given a response regarding the news of Tango Train's impending demise. We have just announced the closure of the original Tango Train and whilst we can't say anything just yet about our plans, rest assured that we will be replacing it. We will be making a special announcement very soon so keep an eye out for more info. Good news is that it will be replaced with something, although maybe I am reading too much into it when they do not specifically mention "new ride"
In terms of the Flyer Saucer, we still do have big plans for the space. Whilst these are yet to be announced we are sure you will be pleased with the plans as it will be put to the best possible use for an amusement park. I have had that chestnut trotted out before..."best possible use for an amusement park". That would be a ride right?? RIGHT? Time will tell but it does appear that they are not intent on moving too quickly with this. This could mean that what is planned for the site requires lengthy, appropriate planning approval ( and after the Hair Raiser fiasco I am sure that LPS are keen to dot their I's and cross their T's) or that the planned replacement is quite major and could include some major construction and or movement of current buildings within the site. All speculation and all good to think about. Its interesting to note that the 2 sites are located directly next to each other, albeit the Flying Saucer site is ( at the moment) and elevated platform. Got my free ride for Sunday afternoon. Might even venture into Wet n Wild for the first time in the morning and take advantage of the cheaper entry fee. I might go for a ride tomorrow. From the map online it looks like Mystery Manor is now gone, I'm surprised they didn't keep it for the school holidays. That was a fantastic attraction. It's sad that the Tango Train is gone, however this opens up brand new opportunities for the park. I wasn't able to get my free ride (too busy riding Pinfaris )but it was great that you had to book beforehand if you wanted a ride, it would have caused serious lines! On another note, has anyone noticed that LPS always seems to get Freak Out every holidays? I mean, its a great ride and all, but I think every single school holidays is pushing it. I visited today and can confirm that Mystery Manor is still there and still as good as last visit. It was jam packed today! ^Awesome, Mystery Manor really makes a visit worthwhile. I was at the park today and can confirm that the Tango Train is now officially closed. The area is fenced off and the beginnings of the removal is already underway. No word yet what it's being replaced with, but I'm fairly sure the staff at the park know as I asked one today and she said "we can't tell you.. yet". When I pressed her further she said "our lips are sealed!!!" I doubt the staff know much if anything, and their "i know but i can't tell you" response is just meant to drive the grapevine (or just irritate you because she felt like having a bit of fun). In other Luna Park related news, North Sydney council are spending $400,000 to restore the famous Alfred Street Archway which has welcomed visitors to Luna Park, the Olympic Pool and Bradfield Park since 1935, the first year of the parks operation. Wonderful news and great to see a council take such a proactive approach to preserving a unique slice of their own history! According to this news article the replacement ride is coming from Italy, so that pretty much locks in a Zamperla attraction. I'd love to see an Air Race or a Power Surge take its place. After reading the news article. I am going to take a guess and say that an Air Race would be more likely than a Power Surge due to the article said it would be suited for a wider audience range. This of course would be if they make a thrill and moderate cycle like Dreamworld have. I was on the train going over the bridge yesterday, it looked like there was some working going on, but it was hard to tell from that distance. Anyone seen the site up close this week? Excellent news and a great find!! An Air Race would be a welcome addition to LPS ride line up but I am not completely convinced that it would fit in the same footprint as the Tango. An Air Race would be a perfect addition for the Flying Saucer site however. I think, given the comments in the article about the height restriction being lowered, we can rule out a Power Surge. I would not rule out a Disk'O though....it would fit into the footprint and would definitely have a wider appeal for families. Interesting times for Luna Park. Lets hope they continue their plans to replace some older rides with some fantastic new additions! As for the lower height restriction stuff, I'd be ruling out a Disk'O, I recall a few years ago one of them came to LPS for the holidays, however the height restriction was 130cm (the same as Tango train), and Disk'O's are not good as thrill rides. I'd be suggesting an Air Race for the space if LPS are seeking a lower height restriction, since there will be a lower height restriction for the milder experience, and the usual 130cm for the "hard style". As for the lower height restriction stuff, I'd be ruling out a Disk'O, I recall a few years ago one of them came to LPS for the holidays, however the height restriction was 130cm (the same as Tango train). Well you would be incorrect if you ruled out a Disk O' on height. The Zamperla site lists the Disk O as having a minimum height of 120cm. Dreamworld also has the Shockwave, which is essentally a Disk O' with a longer track, at a 120cm height. Whilst it is true that the travelling Disk O and indeed the Redback at Aussie World currently has a height limit of 130cm, this is imposed by the park and the ride operator collectively. Zamperla lists the manufacturing recommendation height at 120cm, so there is no reason why LPS could not install a Disk O with the height requirement that they are seeking. Disk'O's are not good as thrill rides. I certainly disagree with you on this point, however that is only my opinion. 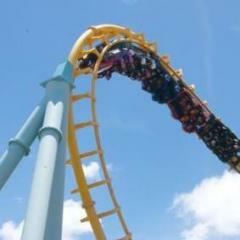 I do offer that Aussie World and countless other parks certainly market their Disk O's as thrill rides and they do offer a thrilling sensation to a point. It is interesting to note that Zamperla market both their Disk O ride offerings as family rides, whilst the Mega Disko sits firmly in the thrill ride bracket. Since LPS are seeking a ride with broader family appeal that has a lower height limit however, this only strengthens the case for them to be acquiring a Disk O.
I'd be suggesting an Air Race for the space if LPS are seeking a lower height restriction, since there will be a lower height restriction for the milder experience, and the usual 130cm for the "hard style". As I posted before, and what you have conveniently failed to address, is that I doubt that the footprint left by the Tango Train will be conducive for operation and installation of an Air Race. The manufacturer of the Music Express ride , Bertazzon, lists their ride specifications as 18.1 metres length and 17.4 metres in width. I assume that this would be similar across the various ride manufacturers that produce a Music Express variant. Zamperla lists the Air Race as 23.1 metres in length AND width. Whilst this does not sound like a huge increase in size, it is worth noting that located behind the Tango Train site sits the LPS offices and staff common areas. This does not leave a lot of wiggle room for an increased footprint, especially for a ride as large as the Air Race. Don't get me wrong, I would love an Air Race to be installed at LPS, however, given the size and the nature of the mechanics of the ride, I feel that it would be far better suited to the Flying Saucer site, which still sits unused and empty. However, if you look at the footprint for an Air Race 6.2, which is far smaller than the standard model and only has a through put of 240 pph, then this certainly could be a contender to fit comfortably within the site. Given the info that we have at hand and going by the fact that LPS are seeking a ride with "wider family appeal" , its my opinion that I do not think that an Air Race fits this brief. The width and length for the Disk O' are listed 24.7metres and 9.3 metres respectively, and this would stand a far better chance of fitting into the current site footprint. Of course I am not stating that it WILL definitely be a Disk O, it is merely idle speculation on all our selves at this point. What is great is that LPS are moving forward and are actively installing new rides. Hopefully this means, that after the hiccup with the ride DA and protest against the Hair Raiser's installation, they are now firmly back on track with their 5 year plan for renewal of the park's ride offerings. The manufacturer of the Tango Train is actually MACK rides. There are many different companies that produce those sort of rides though, so its pretty easy to get confused. Thanks for this but I was not confused. I noted the Bertazzon Music Express ride because I could quote their specifications. Mack's website does not list their ride specs which is why I followed this comment with this statement " I assume that this would be similar across the various ride manufacturers that produce a Music Express variant." That point is interesting though. The Tango Train is certainly an older ride , but not one that is extinct and certainly one that is still being manufactured today. Given its popularity, it is surprising to think that LPS did not just engage Mack or any of the other manufacturers that still produce Music Express rides to simply replace the Tango with a new unit. All good @Jobe . I would have loved to have seen a Tango Train mk II but, oh well . As for this new ride that has been mentioned, a Zamperla Flying Carousel would be nice to see and it fits in the specifications (16.20 x 16.20 metres). This could be interesting! Apologies for the terrible image but its the best I could get from the Ferris Wheel. I took this pic around four weeks ago when I took my son to LPS for a daddy day out. That is a brand new mural being painted with a New York city skyline it seemed. From the carousel you can see inside the old queue line but it was still yellow at that point. I am amusing LPS will take its time when it comes to new attractions. Also need to remember ( or maybe some of you don't know ) Behind the mural is another office area usually used as a cash room and area for holding tickets wrist bands ect. Hope people enjoy the terrible picture.